Hello and welcome to my blog! 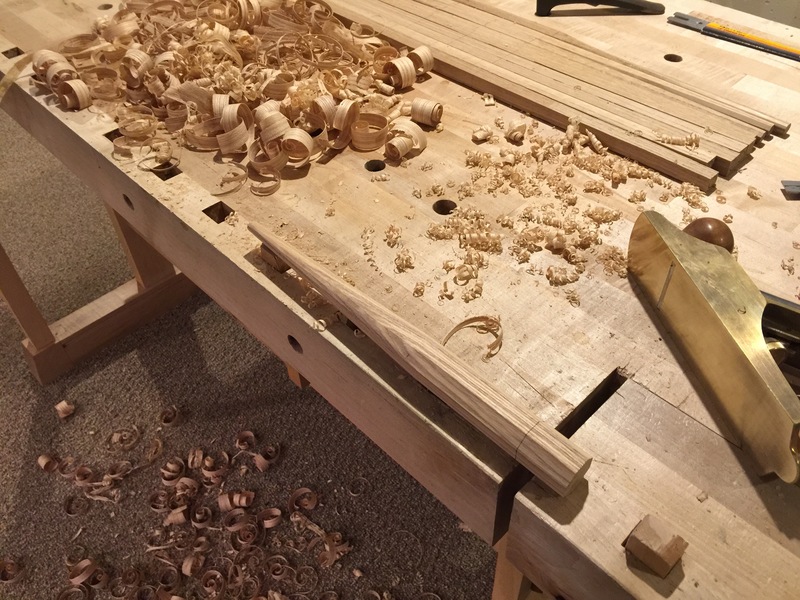 This post continues a series in which I’m building a low chair and table of Honduran mahogany for a tea house. My progress in building the chairs has continued along, each stage requiring much consideration and often specialty tools. I’ve had little issue bringing in new Japanese tools for the chair, most can be acquired by a specialty maker quite quickly and flown over. I have needed a few western tools, however, and found them to be near impossible to acquire on short notice, with exception to a draw knife which my friend John Aniano was kind enough to lend to me. John is a specialty bow maker and makes an incredible product. I’ve included a link to John’s site at the end of this post. The chair I’ve designed is based very loosely on the Fanback Windsor chair. The parts that feature similarity are the chair seat, comb, spindles and posts. The Fanback windsor features a solid wood, carved chair seat that supports two posts (heavy spindles) joined up to the seat with a round tapered mortise and tenon. The posts are the main support for the back ‘comb’, the comb being the curved wooden back support. That back is further supported by nine thin tapered spindles which run along the back edge. The spindles and posts, in traditional chair making, are riven from split quarters. Being without green lumber at the ready, I’ve taken to using typical sawn stock available locally. To make use of sawn stock for this purpose, I’ve taken measures to align the grain into a vertical grain alignment. The process starts by selecting rift sawn material. Rift sawn material, in contemporary use of the term, refers to lumber in which the end grain runs at a diagonal to the sides. The reason for starting with rift sawn material is a very practical one. When sighting down the board you can plainly see on both edges the direction in which the grain is running. The material is marked along the faces, which are cut to follow the grain, then the board is turned onto its side and cut along the grain that way. The resulting material is of rift cut stock with grain aligned perfectly vertical. This meets the truest definition of ‘vertical grain’ and closely mimics that of riven lumber. I’ve set aside spindle and post blanks in both white oak, for the client chair, and white ash for the prototype chair. Typically in the construction of a Fanback Windsor chair, the posts will join up to the seat using a tapered tenon, specifically a tenon which tapers at 6 degrees (3 degrees per side). Tapered tenons are made by first boring a hole, then reaming with a tapering bit. On hand I had a 12 degree bit, and a 3 degree bit, but nothing quite right for the present task. A new bit was at least four-six weeks out and being unwilling to wait I set out to make the tools needed. I found how-to’s for constructing a tapered reamer on Peter Galbert’s blog, Jennie Alexander’s blog, and A Riving Home, a blog about riving mostly. Next I dimensioned the stock, then used a kebiki gauge to mark a center point at either end of the stock. After which I worked the stock into an octagonal shape and then began tapering the stock and forming a cone shape. Once the taper was rounded I marked a center line and ripped exactly that line. I was careful not to deviate from the line and leave a spot for chips to fall into (once the bit were in use). I followed this with my largest ryoba whose kerf was exactly the size needed to support the blade. Following that, a gutter was planed into the bit to receive waste chips and allow them to fall through to the floor. The blade is simply a cheap sawblade I that I ground the teeth off, then filed flat. After which I burnished a burr onto the blade to act as a cutter. The reamer’s first task was to assist in the making of the rounding plane. A rounding plane’s purpose is to form the tapered tenon. The rounding plane is made simply enough; after cutting a tapered hole into a block a blade is fitted on. A twisting motion puts the rounding plane to work and it acts much like an extra large pencil sharpener. I found it handy to size the blade so that it overhangs the block, allowing the material to start with ease. I ground a radius into the starting corner to help minimize split out. Now, with the necessary tools at hand, it was time to begin layout and boring of the post and spindle holes. I’ve located the posts by using the front edge of the seat as a reference to a straight edge laid across the chair seat. Then worked from the center line to locate the marks evenly. On this seat I created a bulge along the sides at the point at which the posts would join up to the chair. Next, to apply the spindle lines evenly I needed to first shape the back. I cut the profile using my bandsaw then planed to my layout lines. After which I used my double square and a pencil to gauge an even mark. I want an even gap between each spindle and post from the head on view of the chair. I draw back lines from the post hole back to the spindle center line. Then I calculated an even distance between each and laid them out using a pencil compass. Next I shaped the posts to size. I’m planning to cantilever the arms off of the posts and so I’ve carefully located the point at which the posts will taper. I began trimming them with a drawknife, straightened the cuts with ko-ganna then cut the tapers with the rounding plane. The shape was further refined with a spoke shave, but left a bit heavy. Next I bore the holes to be tapered using a brace and bit. It’s handy to use a brace and bit because the bit drives itself into the material, making it easy to stand back and check progress. I’ve set the rake using a sliding bevel and set the splay by eye. I wanted a very slight amount of splay, so little in fact in that calculating a combined drilling angle would likely confuse matters. Once one post is up it can be used to sight the opposing post. These are not quite completed here, the back post has some tuning to be done still. Once their driving in at the right angle, I continue working along until they’re both set into the seat to the same height. Next I bore the spindle holes. The comb (top part of the back) places a bending force on the spindles and I will work to accentuate that by drilling the holes more upright than their installed angle. That bending force should arch the spindle in a way that it will apply pressure to the user’s lower back in use. It also helps to make the chair more aesthetically pleasing in a classical sense. Now, with the posts installed and spindle holes bored, it was time to begin shaping the spindles. The spindle stock I’m using is dried, rather than green, and it is bandsawed along the the grain, rather than riven. I use a draw knife to shape the stock, which is a little bit more of a delicate process in this material, but it will follow along the grain lines as it should. This is very important to the process of making thin and yet strong spindles. The spindles should not have grain runout which would cause them to break rather than bend. Each spindle is tested after being riven to ensure that it does bend rather than break. The spindles taper down from their full thickness of 3/4″ to 5/16″ at the top and 1/2″ at the bottom. The holes which receive these spindles are not tapered, so the spindle shape is a very abrupt taper followed by a very long taper which becomes straight near the end. After working with the draw knife, I used a small ko-ganna to refine the cuts. I’m taking long view photos to show how the spindle goes from it’s rough form to a long straight taper. The spindle is then test fitted into a 5/16″ hole. Then the short side is finished in the same way and test fitted into a 1/2″ hole. I show here the installed spindles awaiting the comb. Once the comb is installed and I can see how the spindles arch, I will further fine tune them, along with the posts. The spindles are very near to their final shape, but the posts are in a rough form and wait much further refinement. The seats, for that matter, also have more shaping ahead of them. The seat pans are complete, but their outside shape still calls for more work, A process which I will do in time as other steps are completed. The mahogany seat, for instance, will not be shaped along the sides before the arms are completed. I had some requests for video of using the adze, and I took video but did not post it along with the previous post. I had fine tuned my adze after making the video and had not wanted to display work further from ideal. However, I’ve reconsidered and decided to post it up with the note that the cut was further refined after the video was taken. I hope that you have enjoyed following along with this post, and I look forward to your comments. Please visit John’s site and have a look at his work, which is fantastic. Awesome stuff Brian. Impressive work on the reamer. When I saw it on Instagram I was sure that you had used a lathe. I may just have to give it a go. What blade did you pick up to use in it? I’m following along with great interest. I have several chairs in my near future. Thanks Greg! It actually ends up being pretty easy to make by hand, I think you’ll find it especially so since you have experience making octagons. The blade I used was a compass saw blade, just went to Home Depot and found one with a plastic handle, easy enough to remove and discard. Those Dunbarites have a sneaky way of doing tapers, one of their students discovered it. But I forget the exact details. The rough idea though is that there are three diameters. You prepare the first as you would any square section which in their case in a chairmaking method. You have a square piece that is basically the max diameter. On the long end (actually most of the spindle) you convert the square to an octagon, which for anyone used to working green wood with a drawn knife is a silent mater of cutting the corners off in basically one pass, or so. Blistering fast, no rough tool sounds. Obviously for the major diameter this 8 sided stage will be reduced to a round. The next step is to cut the corners again to return the octagon to a square. Another virtually silent process, our teacher turned out all the spindles for his sack back in like 20 minutes. You cut direct to that square so you have ramps tapering down to it. Once you have that square you convert it to an octagon, and you have your second pre-round diameter. Then the process is repeated once more to get the really fine diameter. Before this was discovered, they proceeded by feel and measurement, and eyeball. But they discovered that the geometry of the process above was much faster and exactly the degree the spindle reductions had always been. Thanks Tom! I appreciate the insight and I’m certain that speed can be achieved in green riven material. My approach was similar but working in dried sawn lumber I was careful at stages where one could work a bit faster if working in green material.